Makhanya grew up in Lamontville Township on the outskirts of Durban, the youngest of seven children. He was born on 22 August 1959. His father was a teacher and school principal before becoming an inspector, resulting in him receiving a good education. Makhanya explains that three schools were to influence him greatly: namely Amanzimtoti College (1974 – mid 1976) as this is where he was first introduced to art; Ohlange High School (1977) where he witnessed pupils burning the school dormitories following the 1976 school uprising in Soweto, and finally Dlangezwa High School (1978) where he obtained a good matric. Makhanya went onto study for a Fine Art degree at Fort Hare University (1979 – 1984), where he also received his honours in fine art and his Higher Education Diploma (1985). 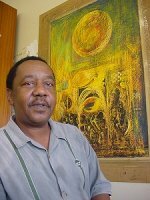 He began teaching at Ntuzuma College of Education in 1986 and retired from his position as art teacher in 1999 to concentrate on his own art. While Makhanya was at Fort Hare his work focussed on the student uprising of the time and socio-political issues such as violence, township life and poverty. Once he retired from teaching he established a base for artists in Durban and formed a group called ‘Third Eye Vision’. The group criticized the old artistic traditions and focussed on the importance of being African. They began to explore and use African symbols and held an important exhibition entitled ‘Mask and Masks’ in 2001. Makhanya’s work became more abstract as he continued to explore African symbolism. This quest forms a strong influence in his work. Family circumstances also influence his work. Makhanya’s father had died in 1967 and this was followed by the death of five of his brothers from a genetic heart condition. He did not believe that he would live long and so he neglected many aspects of his life and rejected associations with his rural family, for example. However, he is now the oldest in the family and finds that he has returned to African traditions and attributes this to a calling of the spirits. He has experienced financially hard times but faces the responsibility to his extended family, including his brother’s children. The family deaths inspired him to read more about the mystery of life and death. In addition, he is always inspired by beautiful artwork, especially abstracts, and talks of a ‘silent dialogue’ between artists. He has been married to Mashadi for seven years and they have three children. His first solo exhibition was held at the African Art Centre in Durban in 2003 although he has participated in a number of group exhibitions prior to this. Makhanya prefers to work with oil pastels and builds up his colour surface and uses a sgraffito technique to etch into the surface to provide colour variation and surface texture. Makhanya is listed in the celebratory compilation ‘10 years 100 artists: Art in a Democratic South Africa’ (2004).